Portugal i/ˈpɔrtʃʉɡəl/ (Portuguese: Portugal, IPA: [puɾtuˈɣaɫ]), officially the Portuguese Republic (Portuguese: República Portuguesa) is a country situated in southwestern Europe on the Iberian Peninsula. Portugal is the westernmost country of Europe, and is bordered by the Atlantic Ocean to the West and South and by Spain to the North and East. The Atlantic archipelagos of the Azores and Madeira are part of Portugal. The country is named after its second largest city, Porto, whose Latin name was Portus Cale. The land within the borders of today's Portuguese Republic has been continuously settled since prehistoric times: occupied by Celts like the Gallaeci and the Lusitanians, integrated into the Roman Republic and later settled by Germanic peoples such as the Suebi, Swabians, Vandals and the Visigoths. In the 8th century most of the Iberian Peninsula was conquered by Moorish invaders professing Islam, which were later expelled by the Knights Templar under the Order of Christ. During the Christian Reconquista, Portugal established itself as an independent kingdom from León in 1139, claiming to be the oldest European nation-state. In the 15th and 16th centuries, as the result of pioneering the Age of Discovery, Portugal expanded western influence and established a global empire that included possessions in Africa, Asia, Oceania, and South America, becoming the world's major economic, political and military global power. The Portuguese Empire was the first global empire in history, and also the longest lived of the European colonial empires, spanning almost 600 years, from the capture of Ceuta in 1415, to the handover of Macau to China in 1999. However, the country's international status was greatly reduced during the 19th century, especially following the independence of Brazil, its largest colony. Portugal is a developed country with a very high Human Development Index, the world's 19th-highest quality-of-life, and a strong healthcare system. 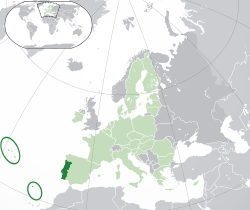 Portugal is one of the world's most globalized and peaceful nations:  a member of the European Union and the United Nations, and a founding member of the Latin Union, the Organization of Ibero-American States, OECD, NATO, Community of Portuguese Language Countries, the Eurozone and the Schengen Agreement.